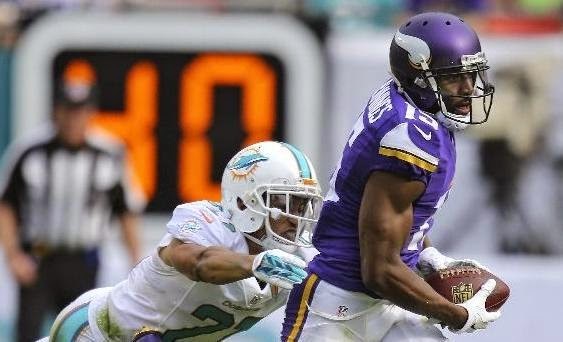 The Vikings couldn't finish against Miami and a poor defensive performance didn't leave much optimism for this squad. Daniel House analyzes the sloppy 37-35 loss from every angle. The Vikings couldn't get the job done after starting strong and opening up with a 14-0 lead. This seems to be a reoccurring theme for this group and their inability to finish games is starting to become frustrating for the players and coaches. The Vikings defense couldn't cover, tackle, or pressure anyone today and they seemed to take significant step back. Miami's offense has struggled lately and they managed to allow 37 points, which is totally unacceptable. The Vikings have been battling injuries and we witnessed how poor our depth is in the second and third tier levels of the defense. The offense placed the Vikings in a position to win the game and you can't pin this loss on a group that scored 35 points. Minnesota's secondary was allowing cushion and the wide receivers from Miami were just being more physical. The linebackers couldn't stop any of the dink and dunk style offense that the Dolphins were executing. Running backs and tight ends were shredding our linebackers and this was a tune that is familiar to many. Finally, the defensive line couldn't apply much pressure and Ryan Tannehill was able to step into the pocket. Penalties hurt as well and the undisciplined nature that was displayed on defense was totally unacceptable. The Vikings had control of this game, but their defense and a late special teams blunder were the death of them during the crushing 37-35 loss to the Dolphins. There wasn't much more rookie quarterback Teddy Bridgewater could have done to help the Vikings win this game. He finished the day 19-for-26 with 259 yards, two touchdowns, and an interception. His lone turnover came when a pass tipped off of the hands of Matt Asiata and into the arms of linebacker Derrick Shelby. Three of his touch passes were impressive, including a strike to Greg Jennings for a 21-yard touchdown in the second quarter. His completion percentage continues to spike and his ability to read the defense is very impressive. The Vikings offense scored 35 points and that is definitely a reasonable amount to win the game. Bridgewater is showing growth every week and you have to be encouraged that he wasn't the reason the Vikings lost today. Matt Asiata carried the ball 16 times for 58 yards and two touchdowns. He continues to be the goal-line warrior and his ability to score inside the 5-yard line has been an impressive feat. Just DeMarco Murray and Marshawn Lynch have scored more touchdowns this season than Asiata. He was averaging 3.6 yards per carry and he continues to run with a ferocious head of steam. Nobody can just arm tackle him, or he will make you pay. Greg Jennings ran impressive corner route to haul in a 21-yard touchdown pass from Teddy Bridgewater in the first half. He led all receivers with 56 yards and a touchdown, on just three receptions. His route running ability and knack for being able to rub off of picks are setting him up with success on crossing routes across the field. Jarius Wright added an 8-yard touchdown late in the game, where he gained brilliant separation off the line of scrimmage on a slant. He continues to be an athletic playmaker in the Vikings offense and is worthy of seeing more action. The Vikings wide receivers were able to make plays and Bridgewater was able to find them. Scoring 35 points should win most ballgames in this league, but the defense didn't get the job done today. The Vikings offensive line used more action to pull guards in the running game and Joe Berger added some beautiful blocks in the second level. That was about all the Vikings offensive line could be proud of from today's game. Mike Harris was destroyed on two occasions by Cameron Wake and Bridgewater was taking a beating the entire game. The pressure also came from the interior and Vlad Ducasse was burned on a frequent basis. The sacks came at poor moments of the game and one in the fourth quarter set the Vikings in a poor situation. It ultimately forced a punt that later turned into a safety, which ultimately won the game for the Miami Dolphins. The Vikings offensive line needs to get the key pieces back next year in order to remedy this issue. On the bright side, Matt Kalil played relatively well and wasn't at the hands of any big mistakes. Rhett Ellison hauled in a critical 40-yard pass from Teddy Bridgewater late in the game that set the Vikings up to to score a touchdown. He showed some smooth acceleration and movement after the catch to get the Vikings deep in Miami territory. In addition, Chase Ford was robbed from scoring a touchdown late in the first half. Bridgewater found Ford on a fade up the sideline for a 22-yard reception and it appeared his toe touched the pylon, but the replay officials upheld the call. The Vikings have been receiving solid production from Ford and Ellison when Kyle Rudolph has been sidelined for seven games this season. The Vikings pass rush was only able to reach Ryan Tannehill twice, but one of them came at one of the most critical moments of the game. Tom Johnson reached Tannehill late in the game, pushing the Dolphins back. It didn't matter, because the Vikings defense later allowed a 3-yard touchdown score that tied the game at 35. The Vikings inability to pressure the quarterback allowed Ryan Tannehill to connect on the short and intermediate passes that plagued the Vikings linebackers and secondary. The Dolphins offensive line had been a sieve entering this game, but the Vikings were unable to cause any sort of havoc to keep the Dolphins offense honest. The Vikings linebackers played their worst game of the season and injuries have struck this group late in the season. Gerald Hodges picked up an undisciplined penalty and was unable to handle Charles Clay during several moments of this game. Jasper Brinkley was struggling in pass coverage and he was trailing behind running backs on a frequent basis. Chad Greenway left the game with an injury and you could see the defense was really missing his leadership on the field. Anthony Barr was out and he was only other player who was making defensive calls this season. The linebackers and secondary was confused and out of alignment on a frequent basis. This was too reminiscent of how the Vikings linebackers performed last season and we can now witness that this group doesn't have the necessary depth to succeed at linebacker. The Vikings secondary was shredded for 396 yards passing and they couldn't handle the physicality and athleticism of the Dolphins wide receivers. Mike Wallace added a pair of touchdowns and was able to outwork the Vikings secondary. It appeared this group was out of alignment and they couldn't get set from a pre-snap standpoint. The Dolphins were gaining separation and the short style passing approach Miami was displaying was difficult to handle. The secondary didn't allow the big play, but they simply allowed the Dolphins to slowly work their way up the field. It was done through short passes and check downs that also killed the Vikings when they lost to Chicago back in November. Cullen Loeffler hasn't had his best season as the long snapper and you have to wonder if he will return when he hits free agency after the season concludes. His low snap resulted in Jeff Locke's punt being blocked, leading to a safety the clinched the win for Miami. You have to wonder if he hasn't been some of the issue to the Vikings struggles in the kicking game. I have noticed his performance declining lately and these types of lapses on special teams are unacceptable when you are trying to win contests.